If we were to pen a letter to this beloved actor stating our adoration for him and his hairstyles, we would say the following. Dear Channing, we have been in awe of all your haircuts, from the buzz cut to the crew cut to the spikes and slick backs. Love, all your fans. Here are 45 Channing Tatum haircut ideas you will want to copy. Buzz cuts and induction cuts are among this actor’s favorite ways of styling his hair. He has always been a man of action, loving sports and movement, short hair complimenting his active lifestyle. If you are ever in need of inspiration for an event in your life that requires black tie or formal wear, look no further than to Channing Tatum. This wonderful actor has graced more red carpets than we could ever count. Even though he usually uses gel or hair wax to spike them up, that doesn’t mean his bangs are not there. 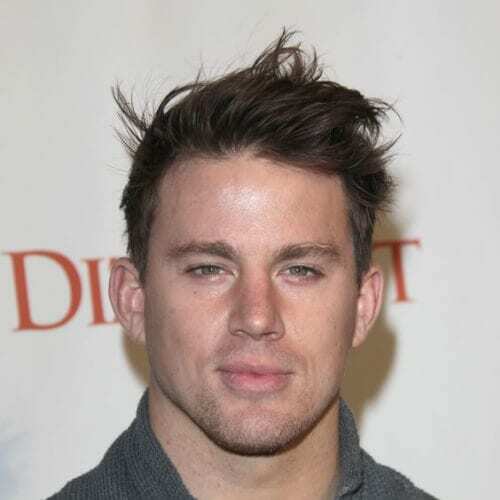 This is Channing with his bangs hanging down his forehead, wispy and brushed all to one side. 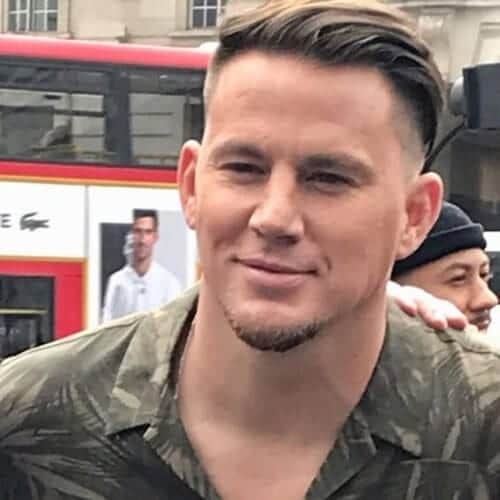 Even though he favored buzz cuts or short haircuts with spikes almost his entire life, recently Channing has moved on to more modern hairstyles. 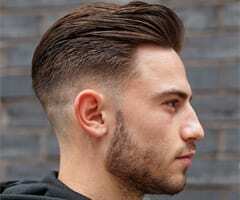 This, for example, is a long and layered slick back with tapered sides. 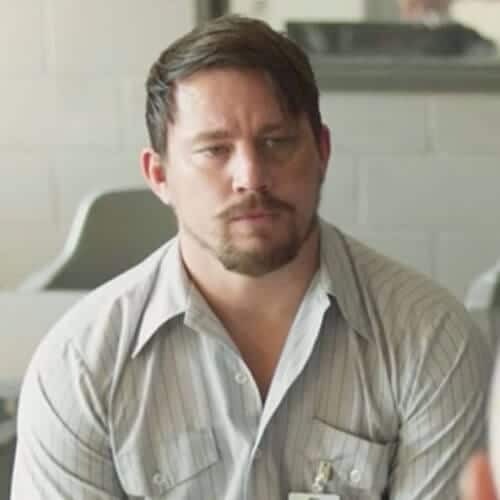 Speaking of spikes, here’s how the most common Tatum haircut looks like. It’s very short and simple, the same size all over the head, and with raised spikes in the front where the bangs usually are. This actor is famous worldwide for his chiseled good looks, green eyes, and gorgeous brown hair that complements his facial features. If you have the same facial type, you can copy his haircut because it will flatter you. You can also go for this messy slick back that will elongate your face. 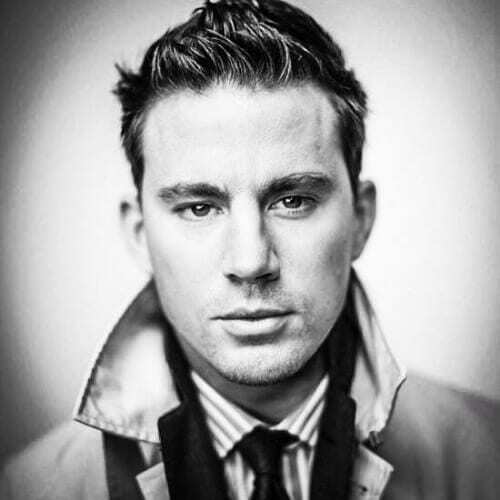 Channing has an incredibly square face with a classically masculine jaw and very accentuated cheekbones. This haircut pulls up his features, softening them a bit. Being as in love as he is with spikes, Channing has tried them in all shapes and sizes. This is a short set which applies only to his bangs. You can use a small amount of hair wax to create and then style them according to your wish. 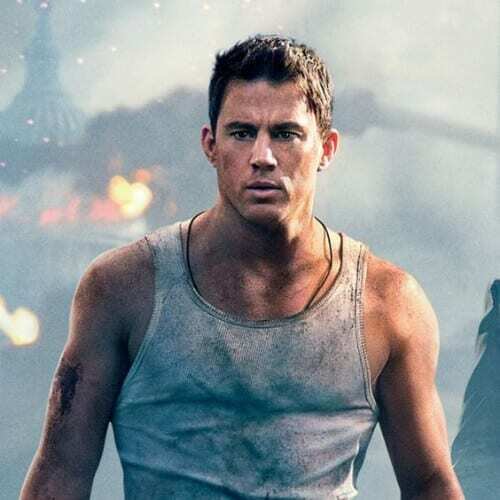 This is one of the most massive hits of Channing Tatum’s career. However, did you know that this movie was actually a remake and that the original starred Johnny Depp? Hollywood never ceases to surprise us every single day. We love to see this actor leaving the hair gel and hair wax at home and simply kicking it down a notch. He has a beautiful head of hair, as you can see here. The wind running through his locks gives him a carefree look. Now let’s see the same haircut from above but with a lot of product in it plus some spikes for good measure. 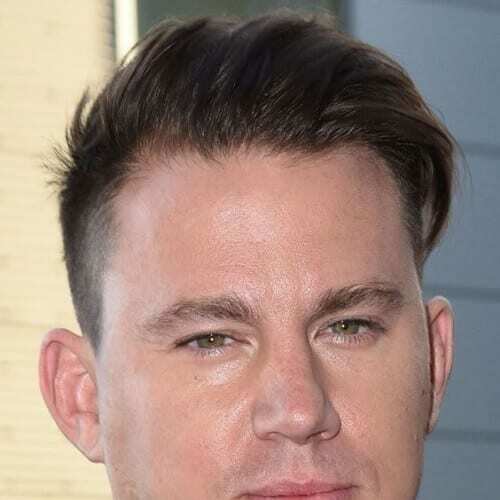 Channing has always loved the 2000s look with messy spikes and a goatee, and only recently gave it up in favor of more mature and modern hairstyles. 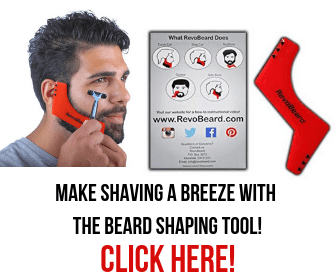 Few male celebrities can look this good while on the red carpet with this little product in their hair. 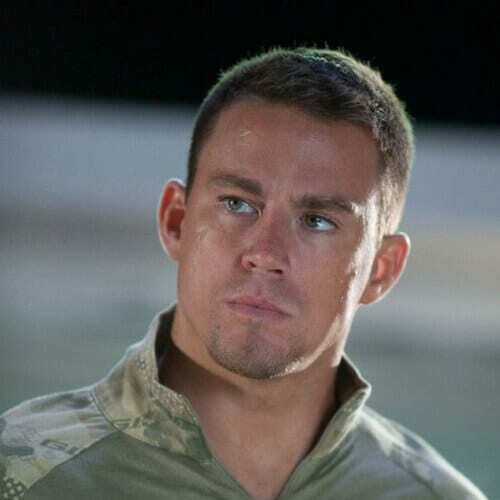 All Channing has to do is spike his bangs up a little and his perfectly chiseled face will do the rest for him. 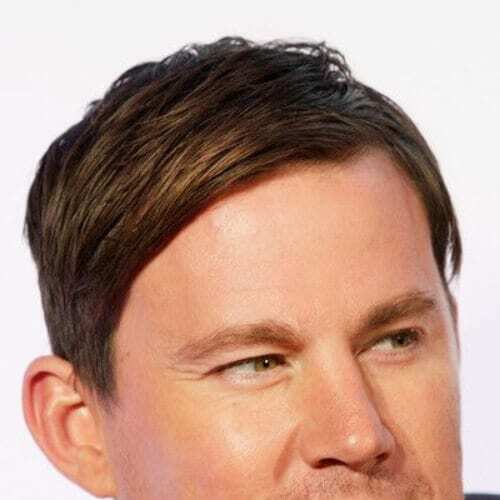 This is a hairstyle that we didn’t get to see much of on Channing. It’s a medium haircut with a side part and a set of side swept bangs. The hairstyle also has the actor’s favorite product – hair gel, in copious amounts. Speaking of bangs, here’s a rare appearance of Channing with 90s bangs. His hair is parted on the side but very close to the middle hairline so that his short bangs gather on either side of his forehead just like men used to wear back in the 90s. Here’s the haircut that Channing wore at the premiere of Magic Mike XXL in Sydney, Australia on the 6th of July, in 2015. It’s a comb-over, medium hairstyle, slicked with a bit of hair gel and some hair wax to make him look like a gentleman. Seeing as he has always been a man keen to follow the trends, it would have been impossible for Channing Tatum not to fall in love with the modern pompadour. 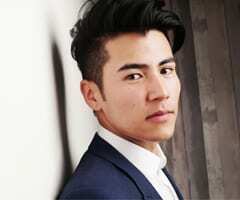 His version has tapered sides and a messy top. You can call this a tamed version of the pompadour we saw earlier. 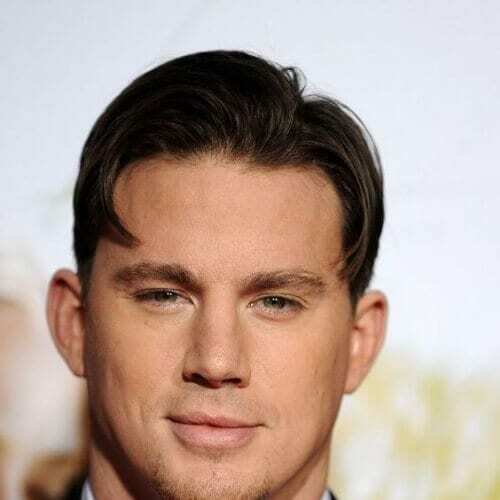 While he was growing out said pompadour, Channing used to slick back his hair or comb it over his head. 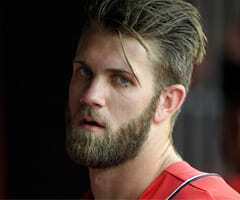 Evidently, all the ladies swooned over this fresh look. The wet look might be a major trend right now, but guess who looked really hot before everyone else was wearing it? That’s right! 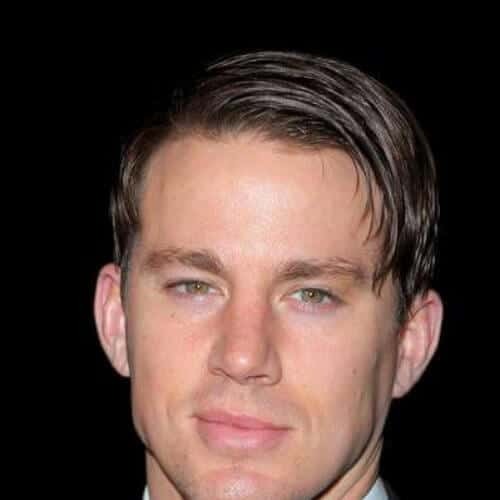 Channing can pull off hair gel like no one else, including with a set of wispy bangs. This lovely feathery, combed over haircut in combination with the barely visible goatee really makes him look like a college professor. It doesn’t really matter what he’s teaching. We’re surely taking his class this semester! 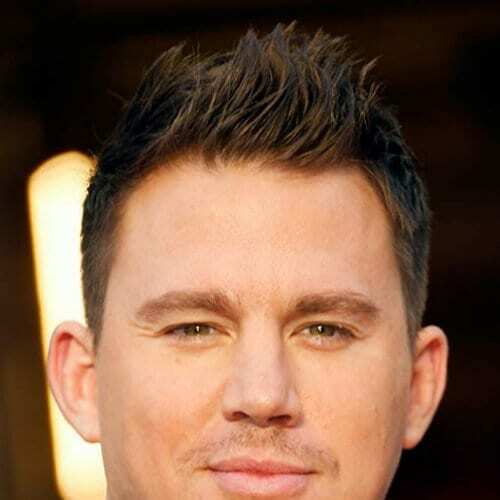 The great thing about Channing Tatum and his hair is that it can be as versatile as the actor himself. He can go from buzz cuts to 2000s gelled spikes to dashing and dapper red carpet looks without missing a beat. This is another type of wet look, one that literally has actor Channing Tatum caught in the rain, but he can pull this one off just as well as the others. His side bangs are on point and you can easily replicate his side part. One thing is certain. 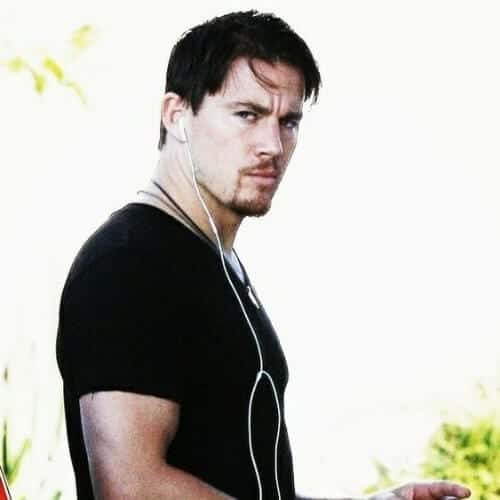 Channing Tatum loves goatees. There are two fantastic things we can say about this. First of all, he’s completely right because he looks awesome. Second of all, goatees are very much in this season. This is, without a doubt, one of the actor’s favorite hairstyles. He has been wearing it at least since he was a sophomore in high school, and we have photographic evidence for that. Just keep scrolling and you’ll see. 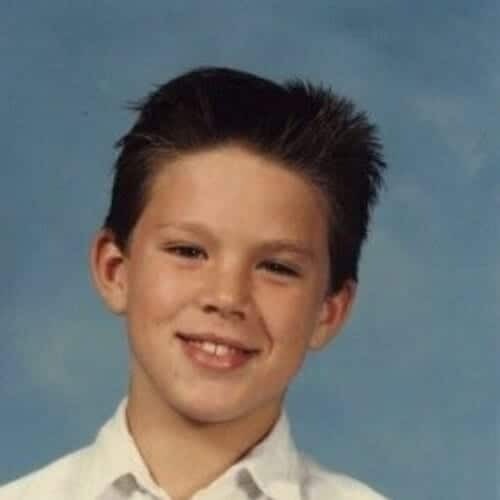 Channing Tatum was cute even as a teenager. When most of us were struggling with acne, AP Bio, and really bad hair, Channing was just cruising with his super-gelled haircut and messy spikes that made him look like a cool teen. This is an actual photo from Channing Tatum’s wedding to fellow actress Jenna Dewan. He wore his signature short haircut with spiked bangs at the front. The couple met on the set of the movie Step Up and have since called it quits. Here’s another real throwback picture of the actor. 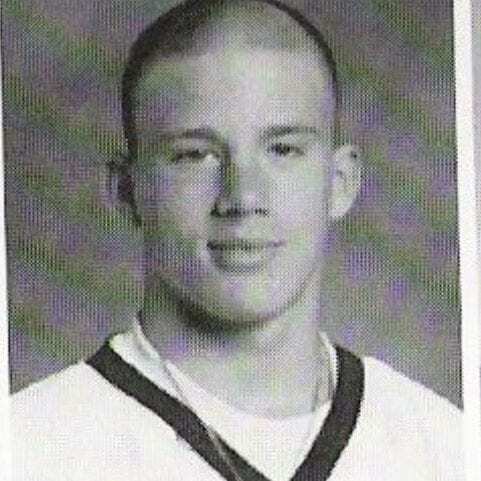 This is him as a sophomore at Gaiter Highschool in Tampa, Florida, back in 1995. Notice how he didn’t go for any of the popular 1990s haircuts. Instead, he chose one of his favorites, the buzz cut. This handsome actor looks good even when he’s not all done up for one of his movie scenes or glammed up for the red carpet. Here he is off-duty with a wet look and his favorite type of goatee looking better than ever. Speaking of red carpets, here’s Channing with his then-wife Jenna Dewan at the Golden Globes. He’s wearing a super short haircut, close to an induction cut that also has shaved sides. His front hairline is also short and straight. When walking on the red carpet, this actor has been known to approach other hairstyles as well. This is a comb-over with a side part and an impressive amount of hair gel to keep everything in place. We have to admit that we are absolutely impressed with the level of “blue steel” that Channing Tatum is able to produce. His piercing gaze is perfectly complemented by his dark brown hair which highlights the actor’s hazel-green eyes. 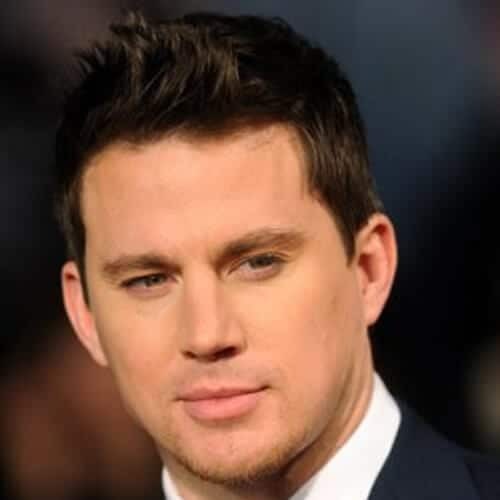 Channing Tatum has played many parts throughout his career, so now it’s time we took a look at some of his movies and study his looks and hairstyles. 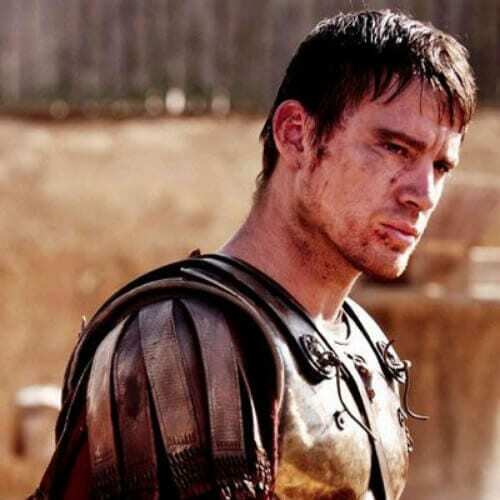 Here he is as Marcus Flavius Aquila with a short haircut and straight bangs in The Eagle. 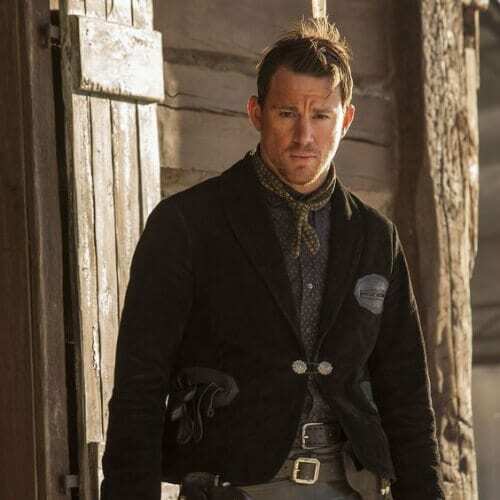 In the movie The Rise of the Cobra, Channing plays Captain Duke Hauser, and has the look to match. He leads a special unit called the G.I. Joe against a very evil organization fronted by an arm dealer. 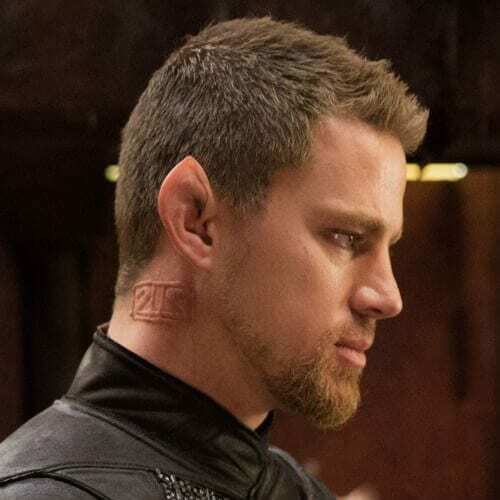 As Caine Wise in the much-debated Jupiter Ascending, Channing had to have a very special look. He is half human half dog, which translated into him wearing blonde hair and a blonde goatee as well as pointed ears. 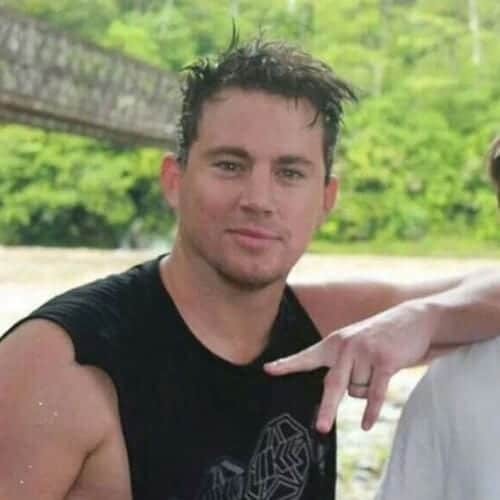 Here’s Channing back to his natural dark brown hair color in the movie Ten Years, where he plays Jake, a man surrounded by his group of friends right before their 10-year high school reunion. It catches them by surprise and leads them on an unknown path. Channing played another character named Duke, this time in a movie called She’s the Man. It’s a comedy from 2004 in which Amanda Bynes disguises herself as her brother and spends a few days at his college where she falls in love with one of his soccer buddies. Dear John is undoubtedly one of this actor’s most beloved movies. 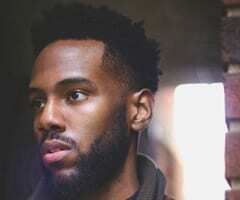 He plays the romantic lead alongside Amanda Seyfried as a couple comprised of a soldier and his very conservative college girlfriend whom he falls in love with while on leave. Although it wasn’t his first movie, it was definitely the one which changed his life. Step Up is considered to be Channing Tatum’s breakthrough role and the one that made him famous, as well as the one where he met his first wife, Jenna Dewan. However, Channing would go on to make an even bigger movie than Step Up, one that would seriously put him on the map Hollywood-wise. We’re talking, of course, about Magic Mike, where he plays a carpenter that has a side job. 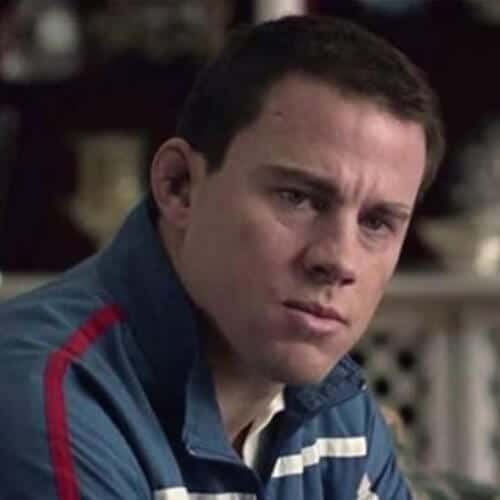 In a complete departure from his other roles, Channing stars in the highly-acclaimed by the critics and fans alike movie Foxcatcher, alongside Steve Carrell. 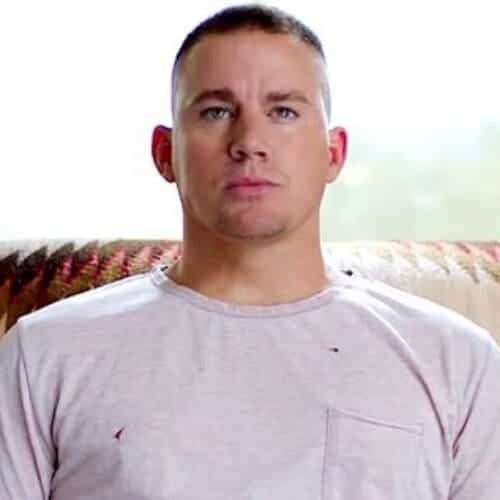 This 2014 movie was nominated for five Oscars and is considered to be the best movie Channing ever made. 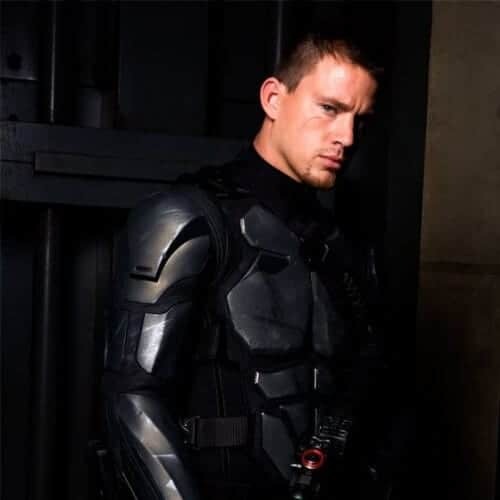 Starring alongside Jamie Foxx, Channing is a simple policeman with an impossibly handsome haircut that happens to be on a tour of the White House with his daughter. While there, chaos ensues, and he ends up saving the President’s life. Another fantastic movie on his long list of successes is The Hateful Eight where he plays Jody. His outback old American hairstyle is on point and his gaze is fierce while he fills a spot on this movie’s colorful set of characters. 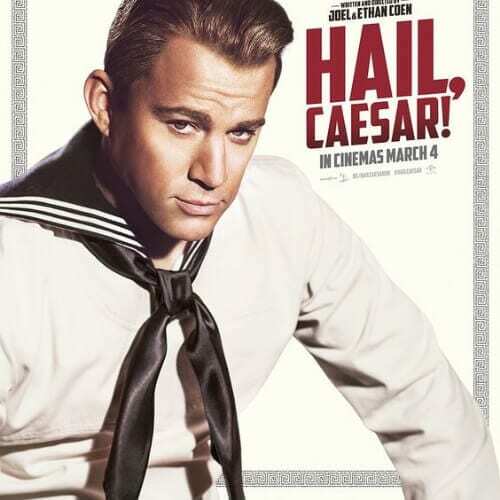 Channing plays and Old Hollywood actor and performer in the Coen brothers’ Hail, Caesar! Therefore, his haircut has to match this purpose. He wears a vintage Hollywood slick back hairstyle. 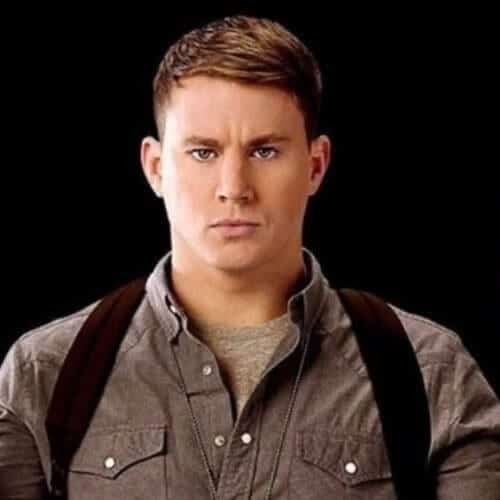 In this bizarre comedy action TV series, Channing Tatum voices Gregor Anghel, a Romanian detective played by a Romanian actor who investigates the murder of one of his colleagues and tries to figure out a plot that is supposed to bring down communist Romania. Channing and Adam Driver are brothers in this film, and they are attempting to pull off a robbery. 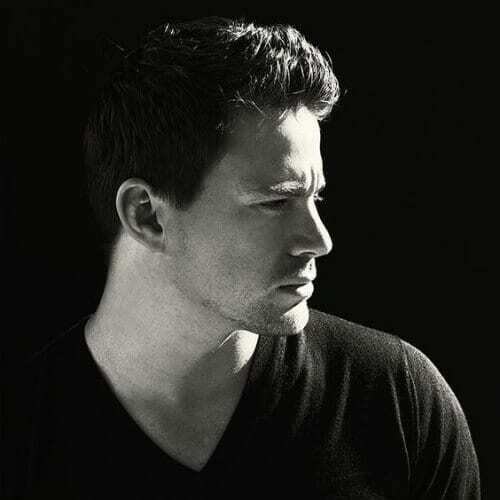 However, even though Channing looks as gorgeous as ever with his amazing hairstyle, the movie was described as Ocean’s Eleven on fast-forward. 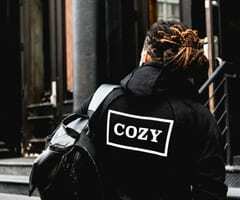 Even though most of the Channing Tatum haircut list comprises induction cuts, crew and buzz cuts that establish his sporty nature as well as his status as an actor who loves action movies, there is no shortage of ideas for dapper and elegant hairstyles either. Let us know in the comment section below which one of these ideas was your favorite and why!